I always want people to think I’m smart and trendy. People who are both smart and trendy, typically know what’s going on in the news, their industry, what’s new with pop culture, anddddd they’re well read. But the truth is, I just don’t have the time to dig through every news outlet there is, or scroll through all the funny cat videos on Facebook, to make myself seem more informed than I really am. Not to mention the fact that I’m sometimes lazy. And, as it turns out, this is the story for many of us inundated with information in all forms throughout the day. We’re not inherently lazy, but we prioritize performing daily tasks at work or school to catching up on information surrounding Google’s latest project, for example. 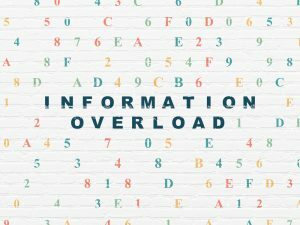 This is called information overload and it occurs when you are trying to prioritize more information than you can, in order to make reasonable decisions. As a result, you either delay making those decisions, or you simply make the wrong choices. Believe when I say that overwhelming feeling you get upon checking your inbox each morning is not unique to you. What we have to realize is, sometime it’s okay to cut corners for the sake of better brain function. Prioritize the quality of information you search for and digest versus the quantity. 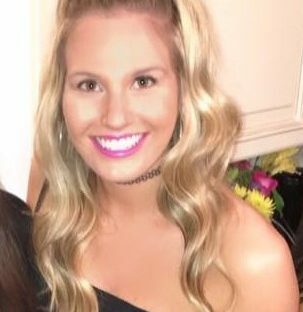 As I’m sure you’ve been told, more isn’t always better. Choose between what you need to know, and what you’d like to know. At times you’ve got to sacrifice personal interests. Be straightforward when asking questions and when giving directions. Don’t Multitask! (Unless you’re eating and watching TV, for example.) Staying on a single task helps you do it better and more quickly. If your technology is the distraction, disconnect when possible. Take a moment each day to clear your mind. If it helps, write pestering thoughts down and then move on from them. Clump together similar tasks for increased efficiency. When you’re truly feeling overwhelmed, just take a break. Even 15 minutes of down time can do a lot of good. Lastly, if you’re looking for information, seek out pieces that have been reduced to digestible chunks, like the list in this blog, so you can jump to the takeaway if needed. As a cheater, you win when you let other people do some of the hard stuff for you- like aggregating content all in one place. Especially in the cyber security industry, professionals deal with many different facets of technology, from hardware to software, coding, penetration testing. And then there’s what’s going on in cyber security news. Where can you find it all? 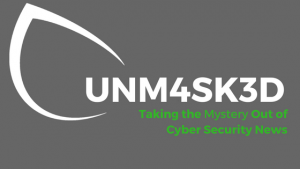 We feel your pain here at Cybrary, which is why we’ve created the weekly newsletter, UNM4SK3D. It will be released every Friday and accessible from the blog page. In my opinion, it’s worth your while because it only covers a few trending topics from that week, gives a brief synopsis and a useful fact or two and does so with a hint of humor. I’ll admit I’m bias because I wrote it, but if you’re already on Cybrary to learn, don’t you want to see those learned skills in action? UNM4SK3D gives you just that. Read it once, I guarantee you’ll be hooked.